I'm a two-fisted solo pianist and singer of barrelhouse, boogie, blues, jazz, originals and everything else I can think of. I was a "sideman" for many years (I use the word "man" loosely!) Here's some of my music, photos and a little background. Enjoy! "Annie not only plays great boogie woogie, but also classics of country, blues and rock - and she is a terrific singer as well. She is one of the only blues and boogie greats to include classical music etudes to stunned but highly appreciative audiences. So, get ready for a full force of Hurricane Annie!" 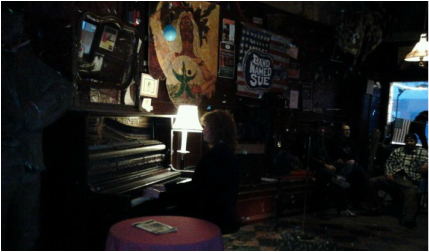 Foundations of Jazz, Blues, Country and Rock 1900 - 1950"
I've been a House Piano Player at Nietzsche's Music Club at 248 Allen Street, Buffalo, New York http://www.nietzsches.com/ since 2003. Love this gig! I play "Speakeasy Sundays" every week at 6pm, and open shows for Dr. Jazz & the Jazzbugs http://jazzbugs.com, the Jazz Cache (young, super-talented jazz musicians! ), and national blues acts, like James Cotton, Tinsley Ellis, and the great Joanna Connor http://www.joannaconnorband.com/. I often get to jam with them... One of my favorite memories is sitting in with James Cotton after opening his show. I'm also performing every First Saturday at 6pm at Hot Mama's Canteen http://hotmamascanteen.com/, here in Buffalo, New York. I was lucky enough to play with the great Mississippi Bluesman Joe Beard for 10 years (1996-2006). 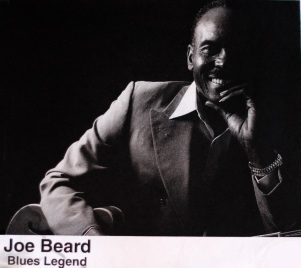 Joe Beard lived next door to the legendary Son House, and played with him regularly, often joined by a young John Mooney in Rochester, New York. I learned everything I know about blues piano from Joe. My left hand really came along, as he wanted the piano player playing the bass lines along with the bass player all night. Joe always encouraged me to take opportunities and wanted me to become a better musician. He's truly a great man and a great musician. I'm very grateful for his guidance and kindness. I still visit him as often as possible, and still love seeing him play and sitting in with the guys again. If you like blues, you really should check out Joe Beard! Through touring with Joe Beard's Band, I was hired by Muddy Waters' son, Big Bill Morganfield and did several tours with him and his band for about a year. I also played in Europe with John Ellison, composer of the hit song, "Some Kind of Wonderful". I was hired by James Peterson, and had so much fun playing with him. I was happy to be interviewed for the national magazine "Blues Revue" for their feature, "Unsung Heroes: The Tradition of Blues Sidemen" (Issue No. 64, Jan./Feb. 2001). Around that time, I received the WNY Blues Society's Award for "Most Promising Local Talent".